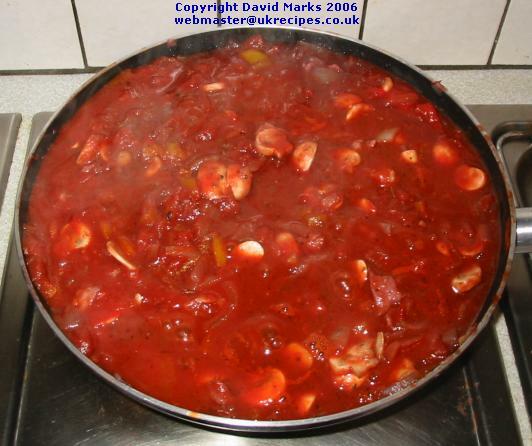 An authentic Italian Tomato Sauce has a base of tomatoes, onions, garlic, herbs and some wine. 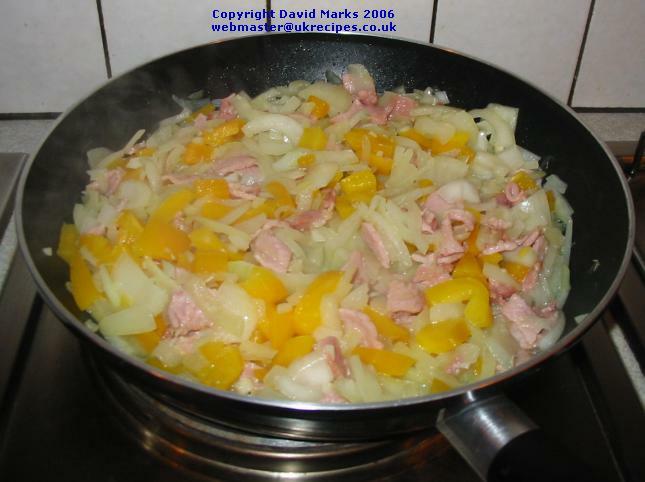 Then add whatever vegetables you have and a small amount meat (ham or bacon do well). We chose peppers, mushrooms and some pesto sauce added at the last moment. Quick and easy. this recipe also uses up leftover vegetables. This sauce is ideal over any type of pasta or meatballs. It has the added benefit of being healthy and a good contributor to a low fat and cholesterol diet. Finally, it freezes a treat (the sauce, not the pasta)! Put the olive oil in the frying pan, warm to a medium heat and add the bacon and onion. Cook for 5 minutes until the onions are soft and the bacon is cooked through. Turn the heat to low and add the sweet peppers. Cook at this low heat for 10 minutes turning the ingredients every two minutes or so. 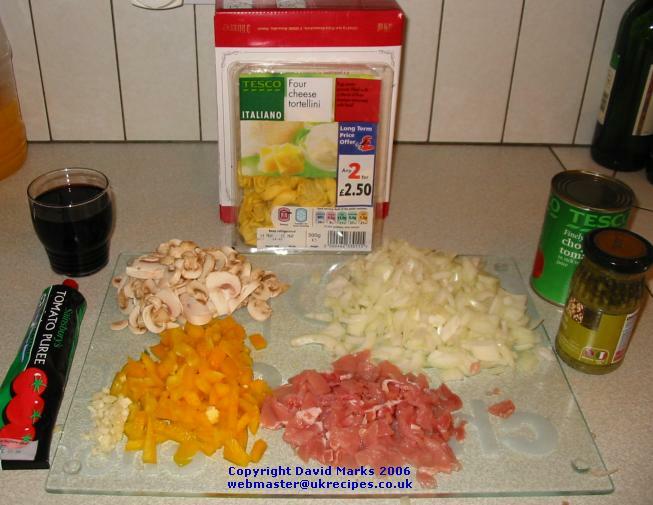 Sometime around here you should start cooking the pasta depending on the packet instructions. 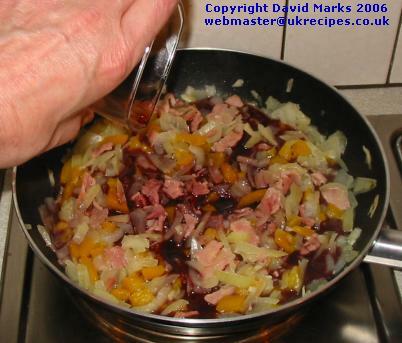 Add the red wine, tomato concentrate and cook on a medium heat for a further five minutes. Put the serving plates in the oven to heat them through. Add the tomatoes, mushrooms, basil, oregano, garlic, salt and pepper and cook for a further 5 minutes. Stir in the pesto sauce and cook for 30 seconds more. 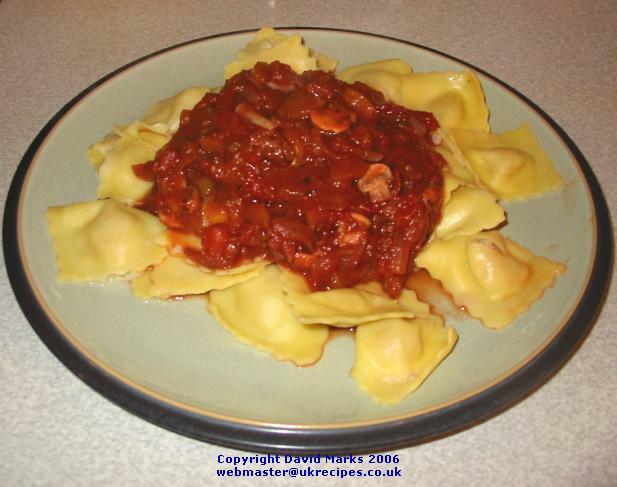 Place the cooked pasta on warmed plates and spoon over the tomato sauce. Sprinkle with Parmesan cheese and eat immediately.